For the purpose of this blog--hello author!--I will only talk about one small specific part. I sold six of my books, Disturbing Complacency: Preparing for Christmas. One of the events of the weekend are the exhibits on Friday and Saturday. Table displays created by seminaries, SERRV, UCC books, banners, and buttons, Turkish scarves, church camp items, etc. allow people to browse, talk with a representative, maybe pick up a brochure or sign up on an email list, and grab a bite of candy. Change and Conflict in Your Congregation (Even if You Hate Both) by Rev. 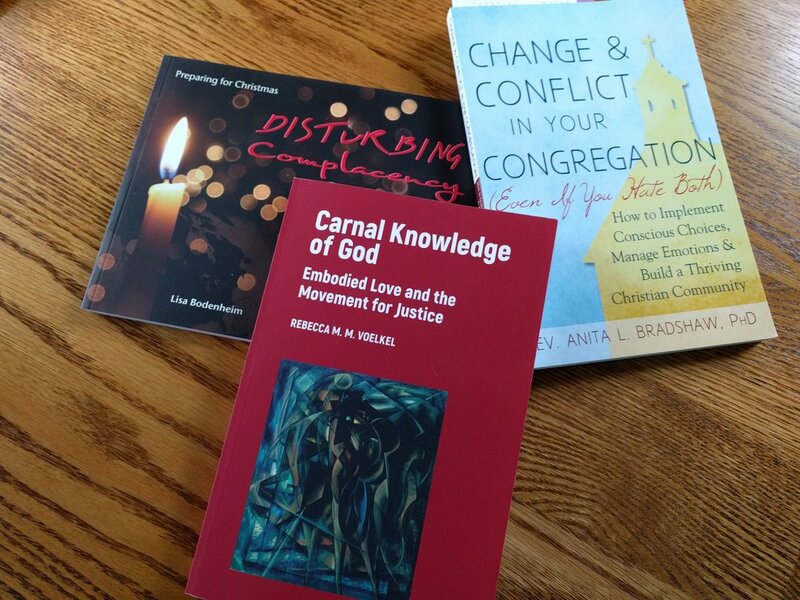 Dr. Anita L. Bradshaw, Carnal Knowledge of God: Embodied Love and the Movement for Justice by Rev. Dr. Rebecca M.M. Voelkel, and Disturbing Complacency: Preparing for Christmas by Rev. Lisa Bodenheim. This year for the first time, we had a local authors (and musician) table. What an excellent idea. Four of us were present but only two available to sit on this table with books from six authors and one musician. Of course I didn't think of this idea. Pfft! I'm an introvert. Sit at a table with people milling around and try to talk about and ask for money for my book? But Rebecca, whose book just came out this year, is very much an extrovert and comfortable reaching out to other people in diverse milieus. It's that piece that made the table such a success for both of us and the other authors/musician. I have been a small church pastor, local and fairly centralized in this area (except for the two years I lived in Scotland). Rebecca is a theologian, pastor, and movement-builder. She has worked within the UCC national setting, leads workshops, and is Director of the Center of Sustainable Justice. We knew different people. We hang out with different people. We attract different people. Lots of people stopped to visit with us. And the best part of it was, when there wasn't anybody browsing at our table, we had each other or someone at the next table to talk with. There's a stimulating energy in the air when conversation happens and that draws people.